Our classrooms are designed specifically for the age group of the children within. Our teaching teams and developmentally appropriate classrooms, keep your child interested and learning throughout their day with us. We will also have a lot of fun! One’s ~ Older infants 12 months and walking to two years old. Toddlers ~ Two to three years old. PreK ~ Three to four years old. VPK ~ Four year to five year olds-heading off to Kindergarten the following year. Children must be the age of their group when they begin. Our safe and nurturing environment promotes growth and development opportunities for your child to explore and learn. We embrace small class sizes and low teacher to child ratios, combined with utilization of a consistent daily schedule. This allows us to give individual attention to each child throughout their day here with us. Our classrooms are designed to give the children opportunities to engage in quality interaction with each other. Plenty of time for play in small groups and one on one is important. Spacious, age separated playgrounds are great for investigating nature, water days, developing critical thinking, understanding cause and effect, building large and small motor skills, and simply running off energy! The curriculum we use is called The Creative Curriculum®, which is nationally approved and widely used. This curriculum is tailored to each age group and is utilized in all classrooms. With The Creative Curriculum®, along with VPK Florida Standards we utilize in our older classrooms, you will find age appropriate materials designed to meet each child’s individual needs. 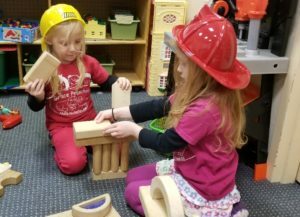 Being UMAP (United Methodist Association of Preschools) accredited, we offer a meaningful program that promises to keep your child learning at a pace that is comfortable for them. Our classrooms and playgrounds provide children with opportunities to make meaningful choices and allow them to explore through active participation as well as quiet activities. Your child will be assigned a personal cubby and/or a hook to keep their belongings. This area will be clearly labeled with your child’s name and/or photo which will help your child become familiar with their classroom surroundings. We will teach your child to be responsible with their belongings and use their cubby/hook on a daily basis. Remember to take your child’s blankets/nap things home every Friday and have them washed for return on Monday. We ask that parents provide a change of clothes and blankets for nap time. If applicable, bring diapers /pull ups, wipes, etc. When your child is ready for potty training, we will work together to reach this important milestone in their development. For your convenience we will send home a note when your child is in need of any supplies, so remember to check their red school bag on a daily basis. Sign in sheets are located conveniently inside our classroom door right by the entrance. All parents are required to sign their child in and out on a daily basis, with FULL NAMES and TIMES. Grace Preschool red bags are utilized daily for each child. Take it home and return it each day that your child is here. Within these red bags you will find various things, depending on age group, such as masterpieces created by your child, notices, daily information sheet, calendars as well as any information pertinent to the facility. Make it part of your pick up and drop off routine to check your child’s bag daily. We also use a parent board in each classroom as an additional way to provide information. Additionally, you are always welcome to call or write a note back for any needs you may have. 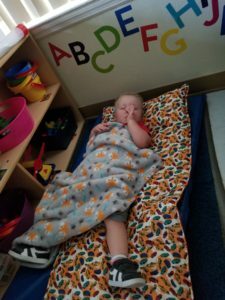 Each child in the class is assigned a mat or cot for their personal use. These are disinfected every day. Bring in one blanket for your child for nap time in case they get chilly. Again, please remember to take your child’s blankets/nap things home every Friday and have them washed for return on Monday. Parent conferences and assessments are conducted two times per year. This assessment becomes part of their portfolio which remains in the classroom and is reviewed during parent conferences. These assessments are done to assist teachers in knowing where your child is developmentally. It also helps to pinpoint the key areas that we may need to spend some additional time on with your child. A morning and afternoon snack is offered to all children attending. We begin our lunch time at 11:45 and wrap up by 12:30. You may choose to bring a packed lunch or purchase a school hot lunch, through the lunch program. Let the office know if your child has any known allergies so that we may post in the classroom and kitchen, for safety. Keep in mind that we do respect the privacy of your child so this information will be hung discreetly. If your child is going to be late for any reason, please let us know. To avoid any interruption to our napping children, we do not allow children to be dropped off during our resting time unless truly necessary. Children learn best when parents, care-givers and teachers work together! 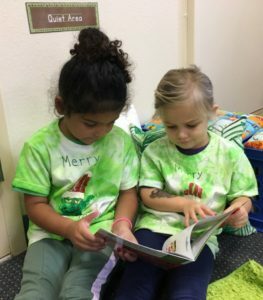 We invite you to be a part of our program through various ways; through volunteering, chaperoning field trips, attending our Christmas and Spring programs, our Costume Parade, the Gala, our VPK Graduation, and more. We look forward to partnering with you and having you join the Grace Preschool family!